John the Red, Paul S, and Conrad joined me for our second game in just over a week, the follow up to the previous encounter between the Venetian-led army and their foes the Ottomans. 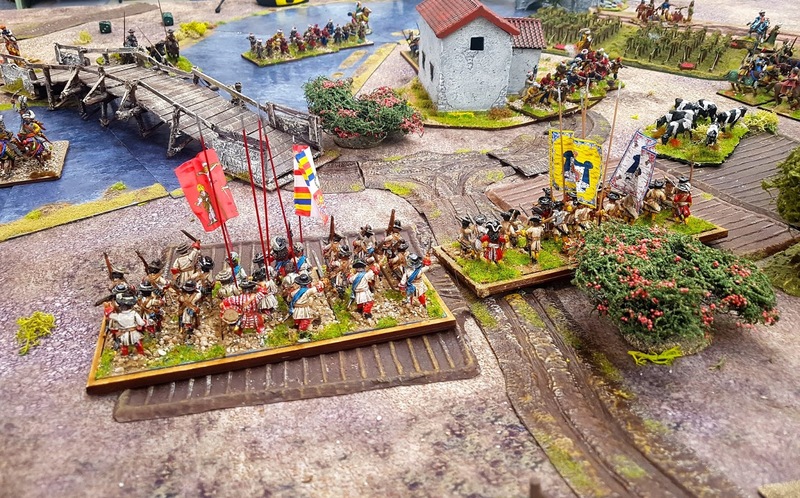 The scenario is fictitious set between the end of the 5th and start of the 6th Ottoman-Venetian wars of the mid-late 17thC. I'd managed to rebased most of the Ottoman infantry and restructure the army, giving them a few more units as a result, but as it turns out they were going to need them! Paul and I were the 'Allies' while John joined Conrad with the Ottomans. 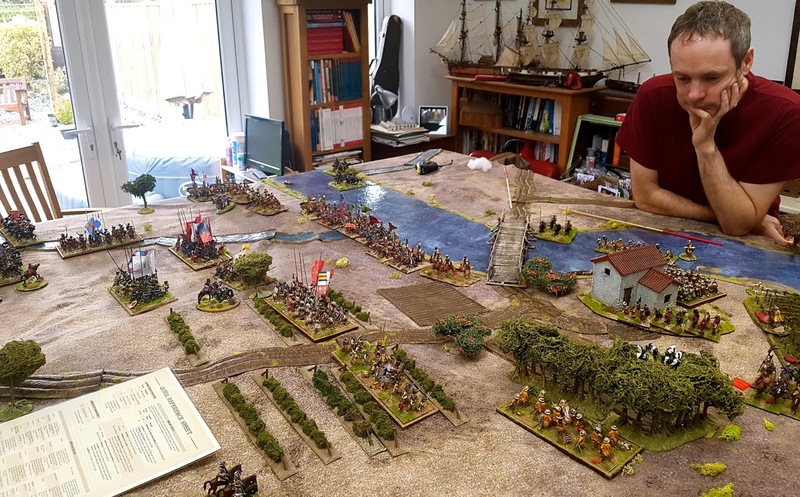 I've already set the scene for the game in a previous post so suffice to say the Turks must crush the infidels while Paul and I had not only to beat them off but win a decisive victory in the process. Easy.....? 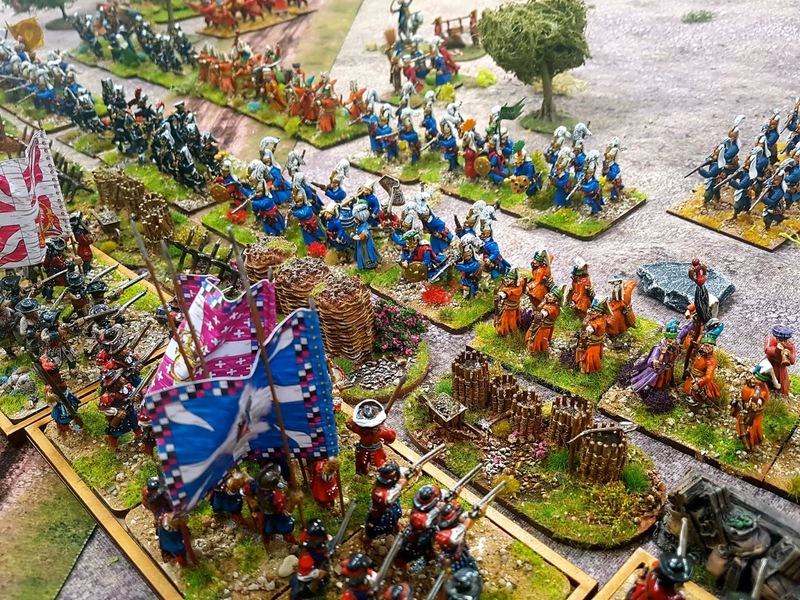 No, especially when after some disappointing dice rolling most of our regiments ended up carrying at least one casualty over from the previous battle. Without further ado, we shall be begin. Lots of pictures which I trust will explain the sequence of events well enough. 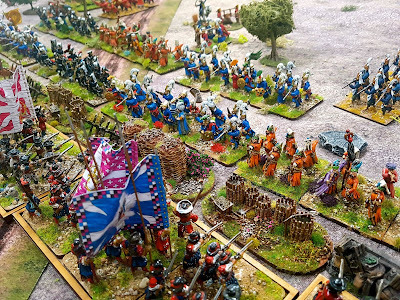 The opposing commanders stare each other down while John finishes deploying his troops. Our right was anchored on the Church of St Polycarp of Smyrna, which was held by a battalion of French volunteers and a light gun. The Ottoman left was clearly not where their big push was coming. This was good as Conrad kept failing command rolls for his Spahis until turn 3, when he finally got them moving. 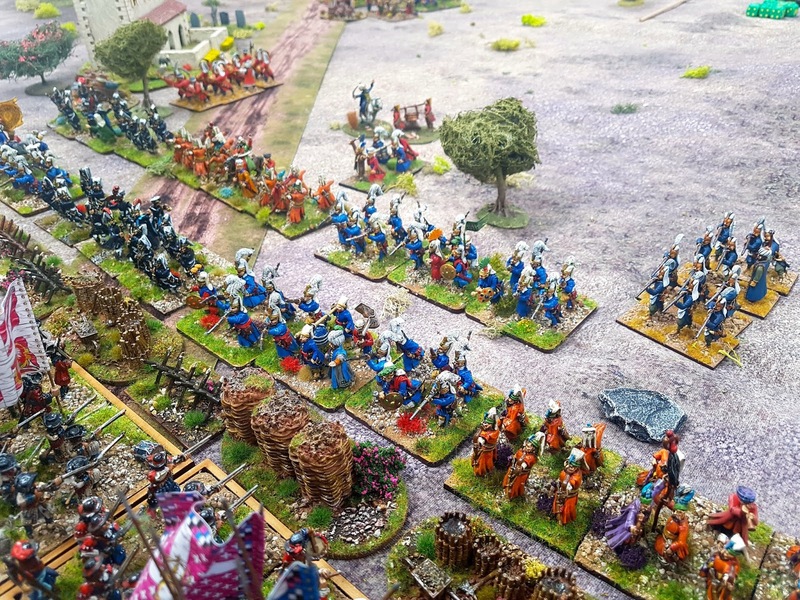 Conrad deployed all his Janissaries in the centre and they moved rapidly across the table, managing three moves in each of the first two turns. 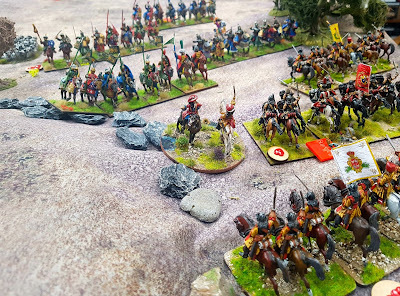 Our left faced a veritable hoard of Spahis, Tartars, Albanians and others. 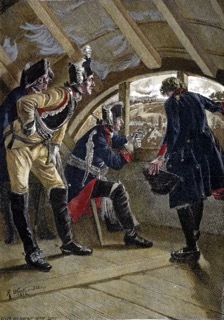 We had a regiment of Savoyard dragoons secreted in the farmhouse and one of Papal dragoons in the tree line. 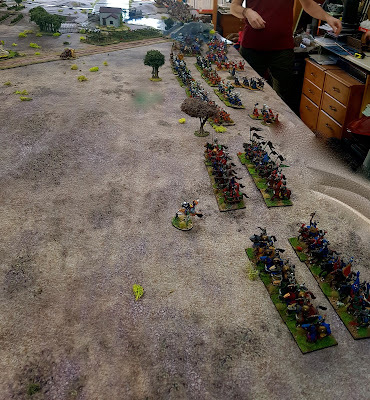 Seen from the Ottoman side, at the end of turn 2 the Janissaries are now just out of range of my infantry behind the makeshift defences! 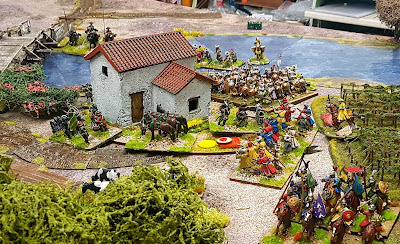 John's Spahi cross the river while his irregular infantry and Balkan musketeers ready themselves to cross the river. I suspect they knew we were occupying the village. Conrad took a chance and advanced right up to the barricades but not in contact. 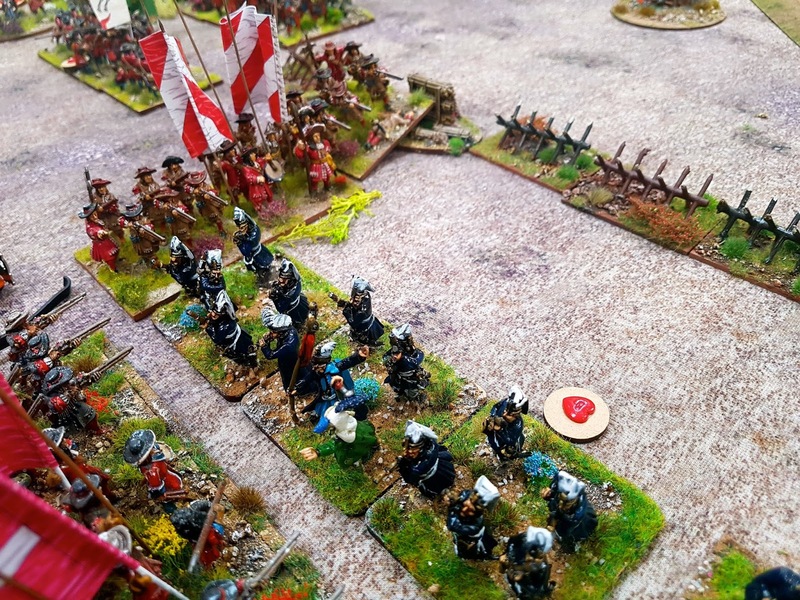 As you will recall, we play with firing before moving, so he'd sacrificed his shooting in the hope (a well placed one) that he would weather the point blank volley from the Savoyard infantry. On our right Conrad's Spahi charged my Austrian and Bavarian cuirassiers and a furious melee developed which was to last for most of the game. John's irregular spearmen blundered, but a throw of a 6 meant they attacked the village. 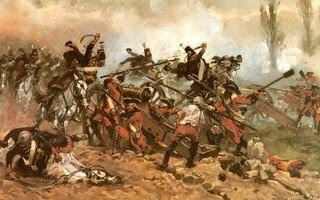 They did well against the disordered dragoons, even breaking into the village, but as hey were classed as 'wavering' the first and every subsequent time they took casualties a break test was required. John threw low and they broke, fleeing from the field. 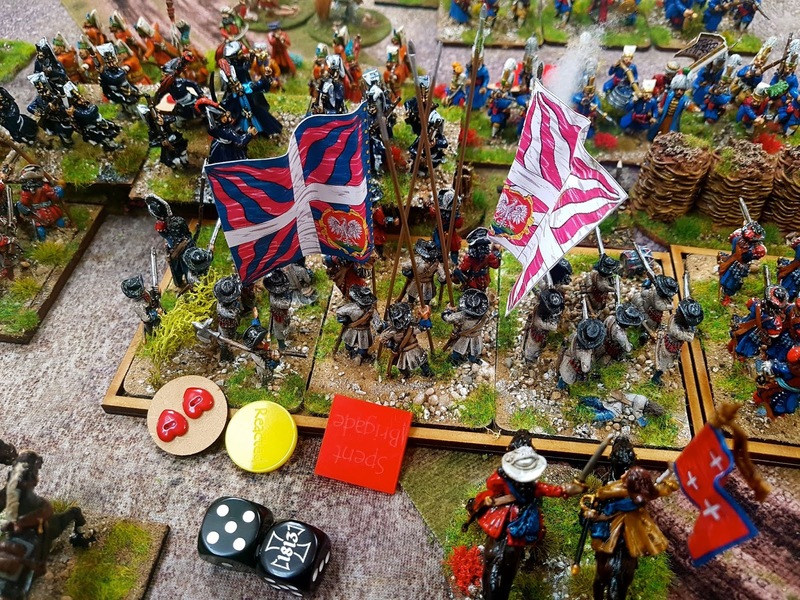 After the first clash the honours were even with two battered units of Spahi and two of cuirassiers. Had I not thrown some amazing saves, the wing would have collapsed almost at once. Battered or not the cuirassiers were going to have to take on more fresh Spahi! 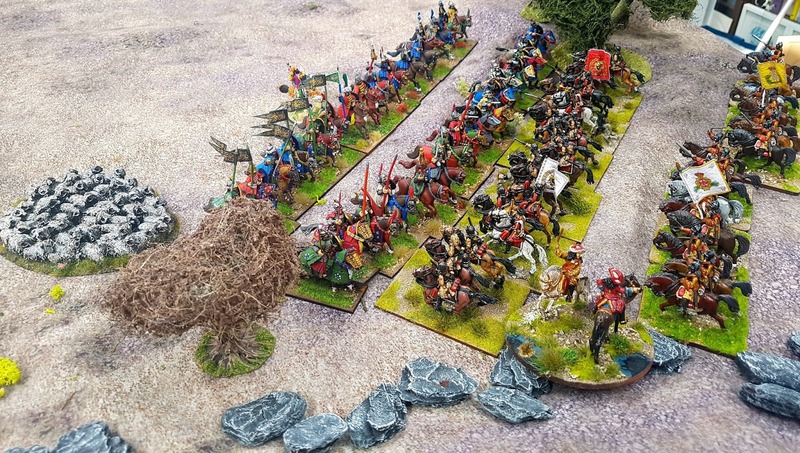 The Savoyards bravely faced the Janissaries across the barricades. 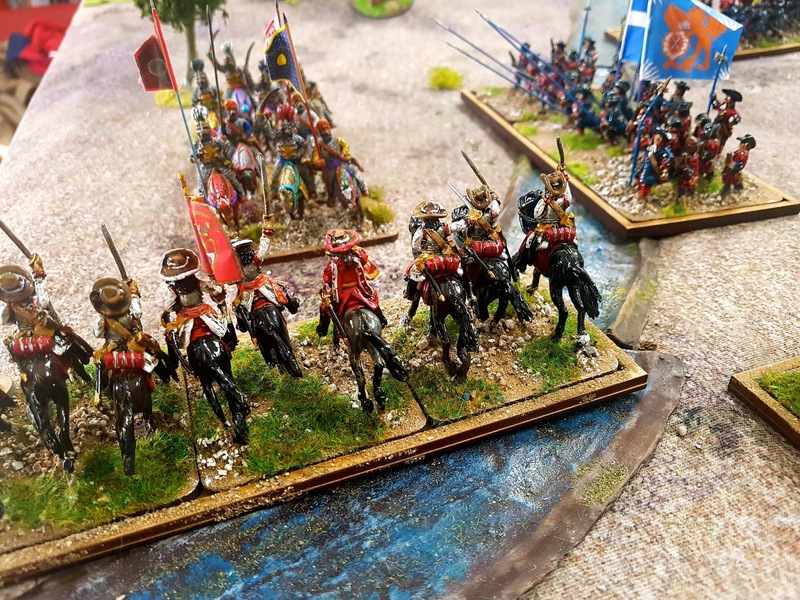 The Savoy Gardia, one of my better regiments. 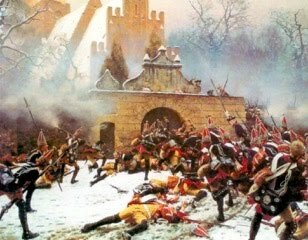 Our first volley was disappointing, but at least the enemy at the right of the barricades were halted through either disorder or becoming shaken. Not so at the other end as the Janissaries charged across the defences, survived closing fire and got stuck in. Another attempt by John to turf the dragoons from the villagers ultimately more successful, although it took several rounds of melee as Paul kept throwing amazing break tests. 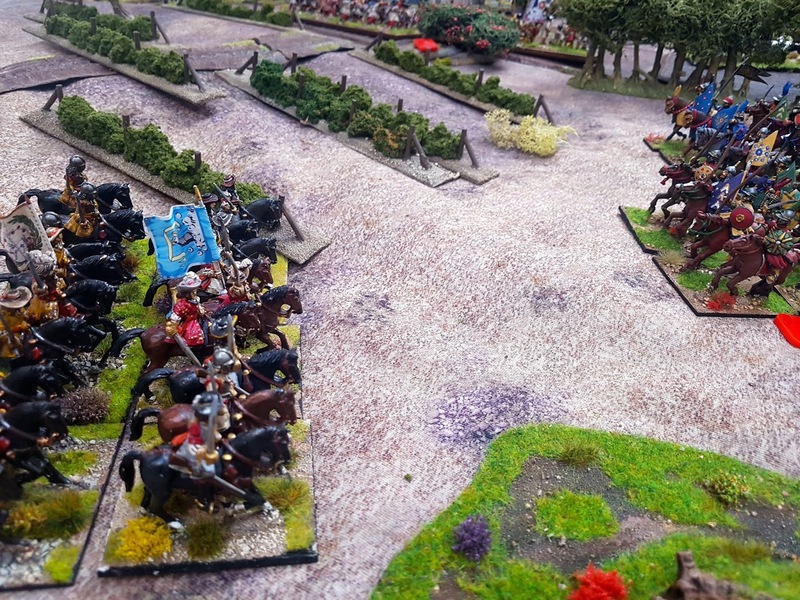 On our left John charged our Celle horse but misjudged the distance and stopped short! 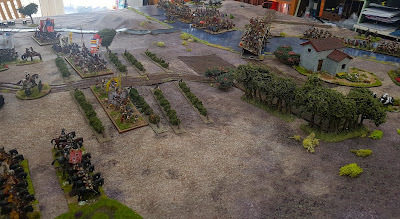 More zambareys and Spahi cross the river facing our left flank. 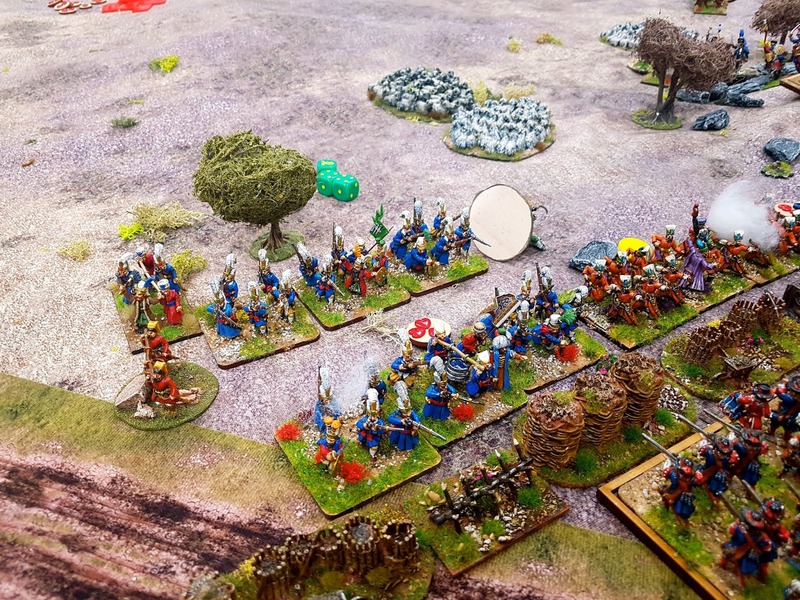 Our dragoons finally are ejected from the village, which is quickly occupied by Balkan musketeers. 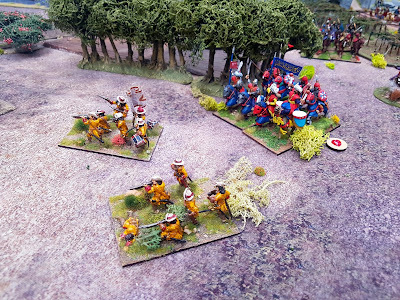 This regiment was badly beaten when charged by Conrad's Janissaries. They just had to pass their break test but were on minus three. I threw 11 so they stood their ground. 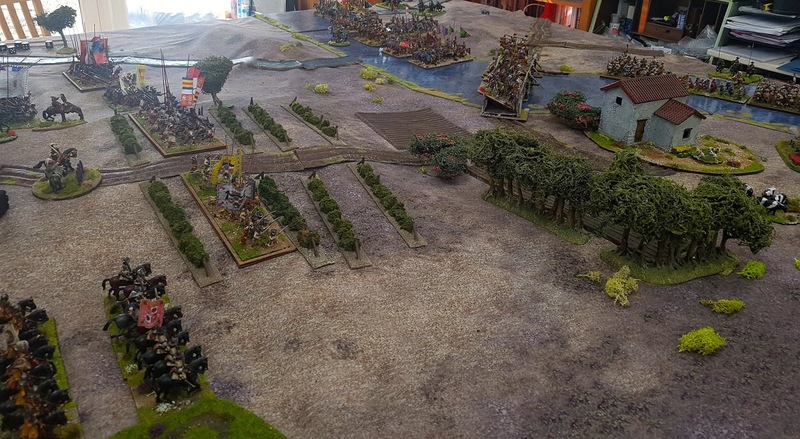 Things were not good at this end of the defences. 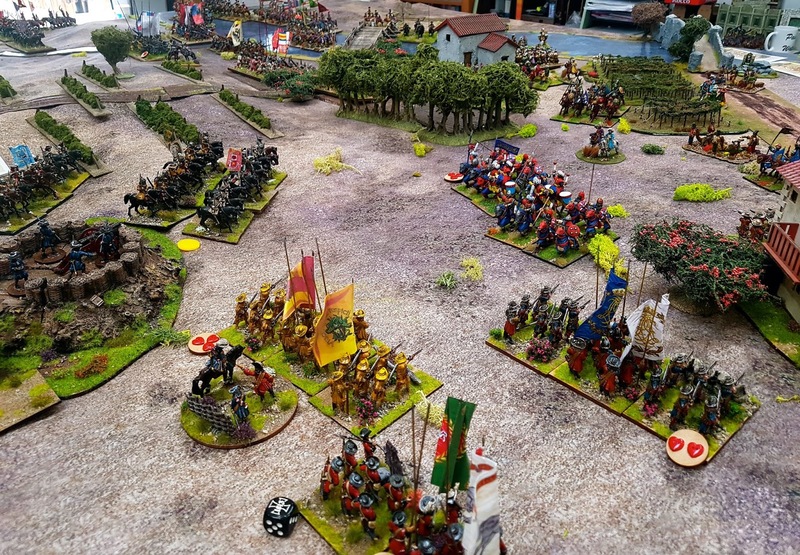 My unit was holding on. Just. In the centre we were under pressure. The Janissaries in red have just overrun one of our cannon but were unable to exploit their success. 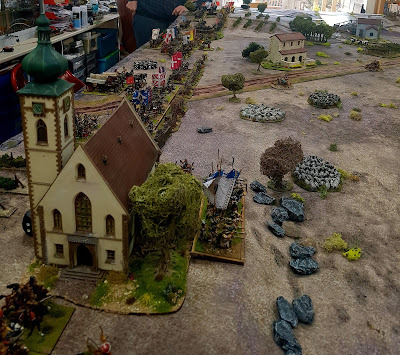 Paul occupied the village and advanced the rest of his Germans to fill the gap and engage the Janissaries. 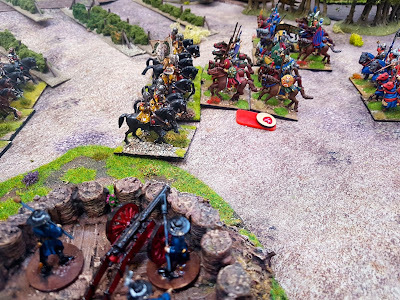 Spahi and cuirassier clashed again but this time my luck with the dice left me. One of my units broke and two others had to retire shaken, making the entire brigade spent. 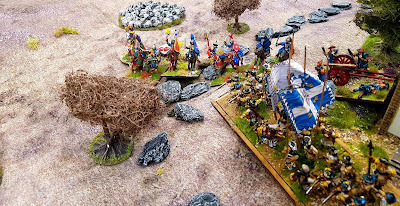 Thankfully the Ottomans were also perilously close to breaking as at least one of the Spahi units was carrying 3 casualties (they were stamina 4). 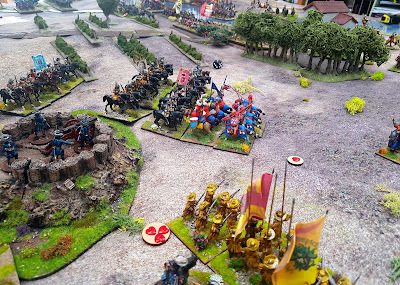 I missed some of the action on our left but Paul got the better of John's Feudal Spahi. One unit was broken in melee, and one of its supports also took to their heels. The Janissaries were hit in the flank by one of Paul's Hanoverian battalions. 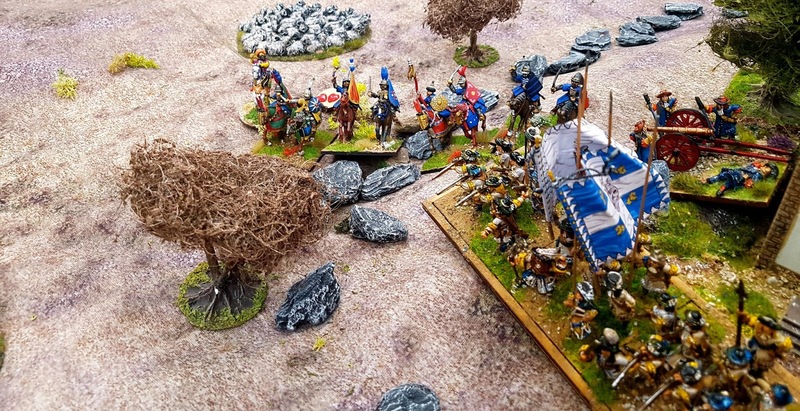 The Janissaries didn't last long and were broken. 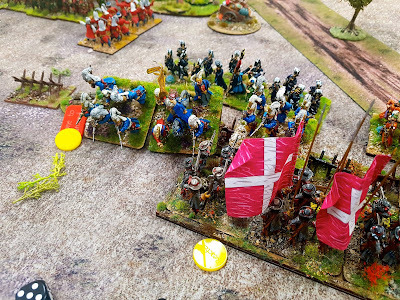 Another unit of Conrad's Janissaries charged my already battered and shaken battalion and routed them. John pondering what to do next. The Venetian brigade of infantry was advancing boldly towards him now that his Spahi had been effectively seen off. 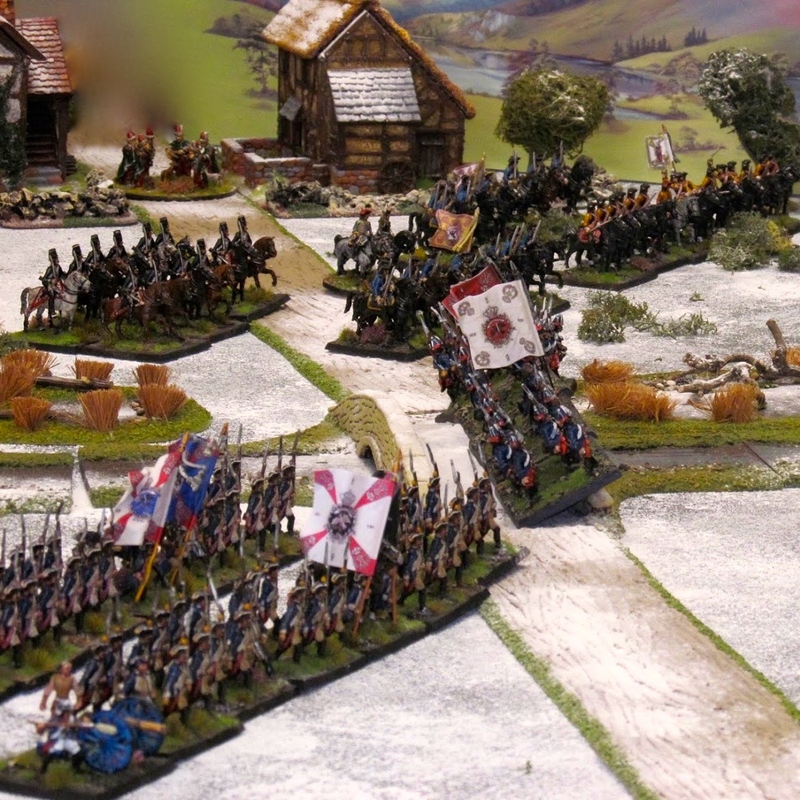 John's Spahi charged the Papal dragoons who failed to evade and were ridden down. Back in the centre Paul's Germans routed the red Janissaries after a brief melee. 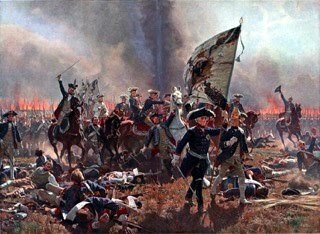 After riding down the Papal dragoons the Spahi swept into Paul's inferior horse. 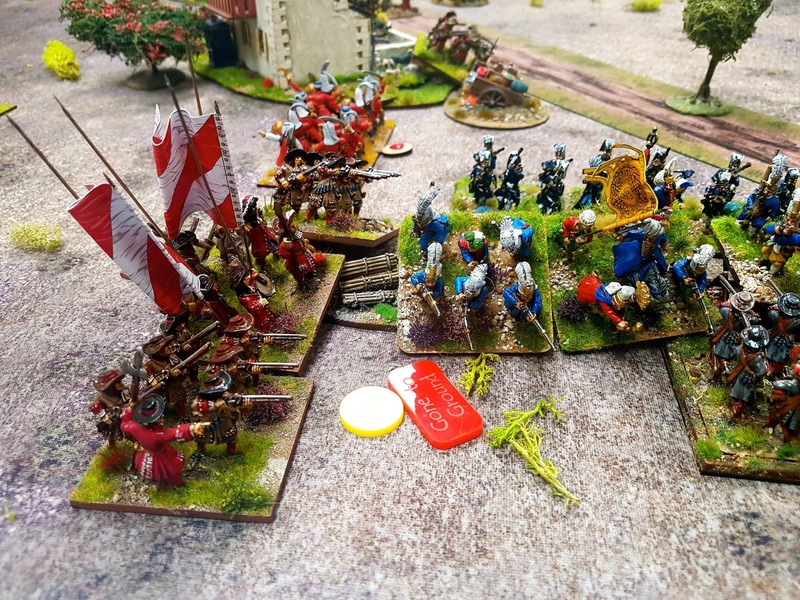 Our infantry in the centre was also under pressure. Back at the barricades the Janissaries pursued my withdrawing Savoyards through the baggage train, overrunning our headquarters in the process. 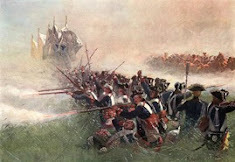 The situation was saved we thought when they were hit in the flank by one of Paul's Hanoverian regiments. 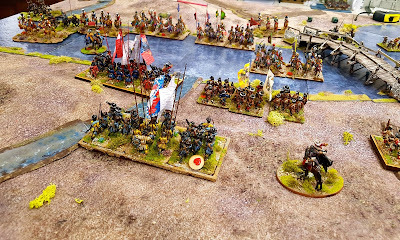 Due to the usual wrong dice rolls at the wrong time it was the Ottomans who surprisingly won the melee. Paul failed his break test and his Hanoverian regiment routed. Our yellow regiment in the centre were forced back after a brief encounter with yet more Spahi . It was looking bad in the centre for our side. 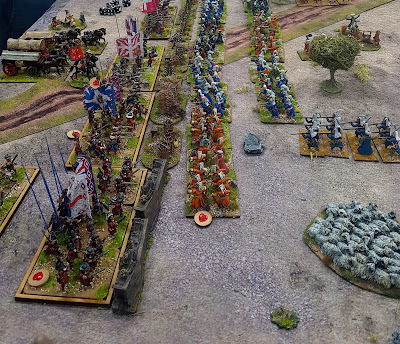 On our left Paul's troops advanced right up to the river. A Saxon and Papal regiment engage the Ottomans around the village. Conrad ordered a 'follow me!' 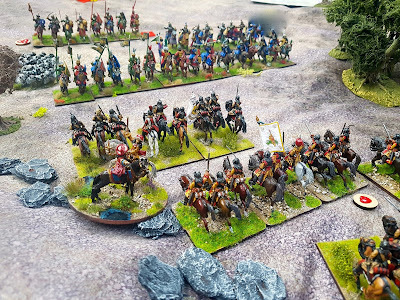 with the Janissary unit at the rear. I had a random event card entitled "Follow him? He's f*****g bonkers! No Way!" Suffice to say the general charged off without anyone following and was killed as per the outcome on the card. 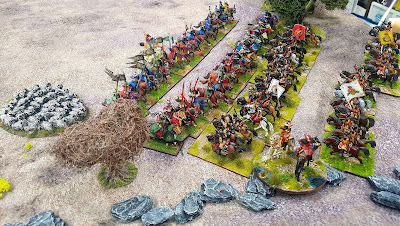 This turn also signalled the end of the attack in the centre as Conrad's Janissaries were now spent, having lost five units broken or shaken out of nine. My French volunteer regiment emerged from the church in order to better engage the flank of Conrad's Janissaries. I wasn't bothered bout the danger posed by his Spahis as I had a 'get out of jail free' random card enabling my unit to form hedgehog without taking a command test. Conrad did charge but pulled back when I played the card. The German horse on our left were slowly pushing the Spahi back. 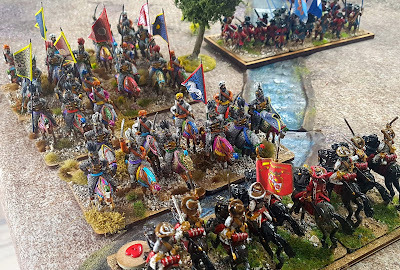 John's cavalry were close to breaking and he wanted to preserve them. In the centre again another attack by yet more Ottoman cavalry defeated one more regiment of our German horse, despite being disordered by pistols as they charged home. Our horse were forced to retreat shaken. As it turns out we had to call it a day at that point. 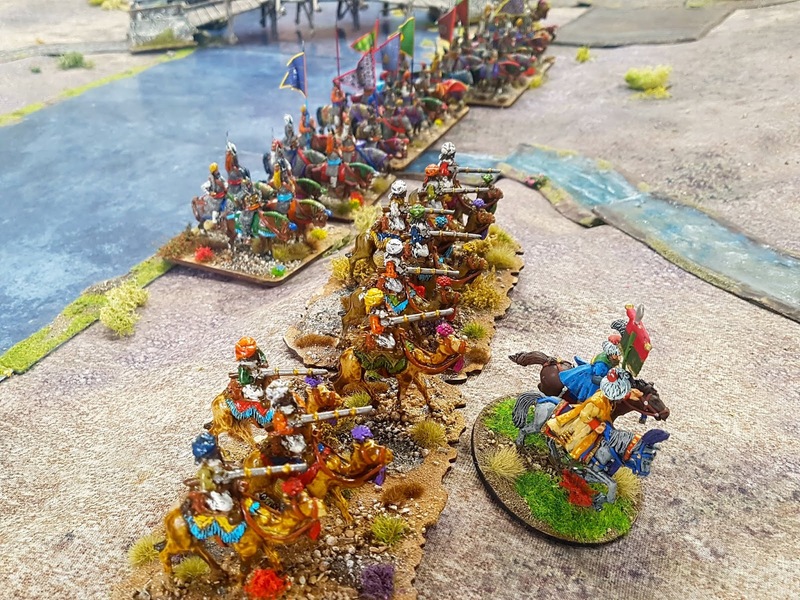 With the Janissaries broken the Ottoman commanders agreed that it would be wise to pull back, especially as so many of the remaining brigades were close to break point. 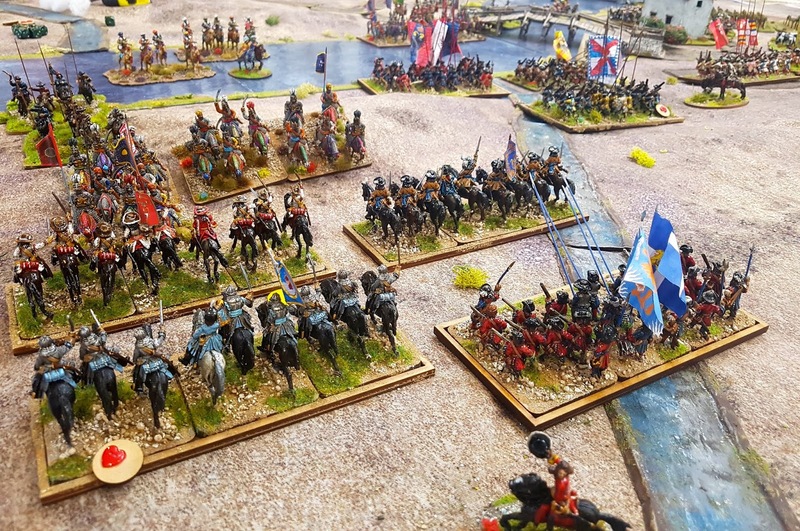 Only our cuirassiers on the right were out of action, although as noted above our other cavalry command were very close to breaking. But they didn't. The Venetian-led alliance had achieved its first objective handsomely in beating off the Ottoman attack. 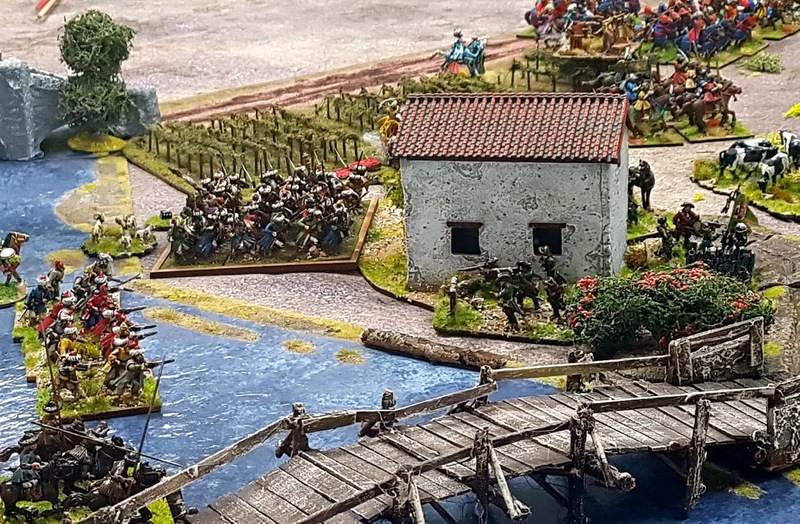 Their second objective of inflicting a crushing defeat on the enemy was almost achieved, but not quite. Ok the Ottomans had no decent infantry left and their surviving cavalry were well and truly battered, but we were very close to loosing all of our remaining cavalry. 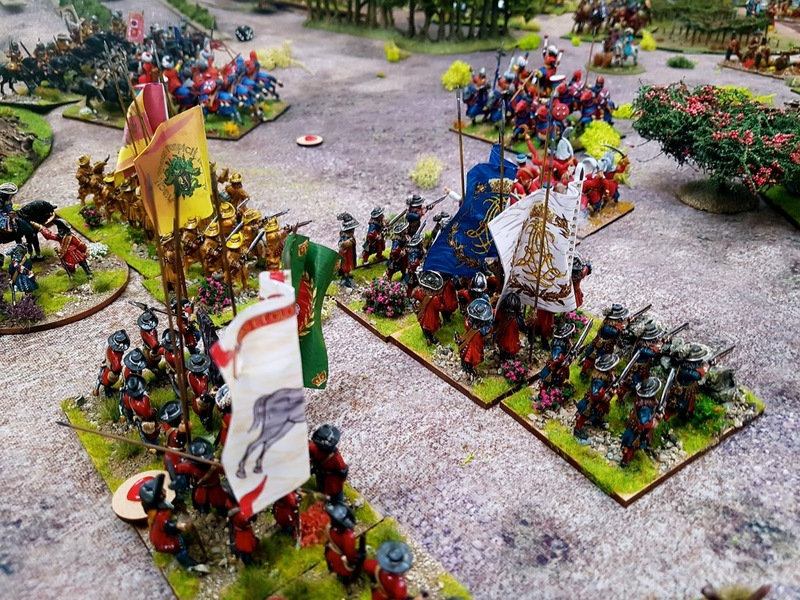 Our three infantry brigades were however still effective fighting forces despite their losses so while not a crushing Ottoman defeat nor really a decisive one it was still a victory of sufficient magnitude for the Venetians et al to regroup and have another try at getting through to the beleaguered Venetian garrison at Prebranac as the Ottomans would not be in a position to intervene in time to prevent its attempted relief. But thats another wargame. Another excellent game. 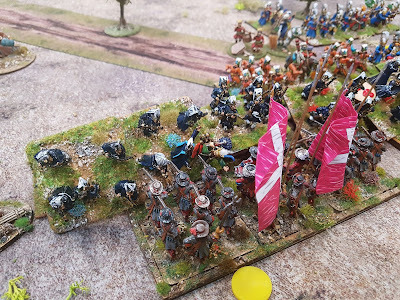 A sensible approach to the use of admittedly heavily-tinkered-with Pike and Shotte, and having a sensitive approach to playing the period and not the rules worked yet again providing an exciting and challenging game for us all. 'Wargamery stuff' and playing the rules is frowned upon in the Burrow and by everyone who attends on a regular basis. The random event cards again provided several amusing and/or annoying moments during the game. 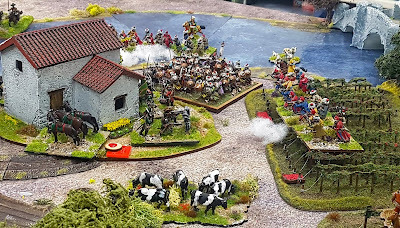 Annoyance was the usual feeling when one forgot to play a card on the enemy that would have been a proverbial spanner in the works! 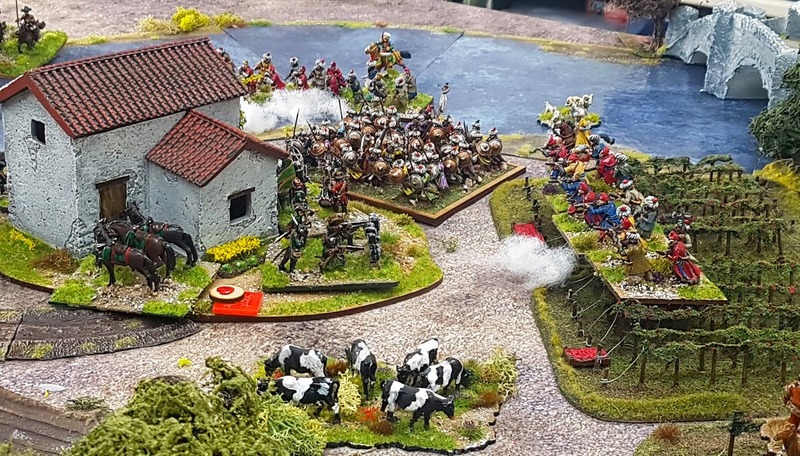 I need to do some extras that are more directly relevant to the 17thC as quite a few of the current set are only really relevant to the French Revolutionary Wars. Not sure when the next game will be, probably one day over the Easter weekend, but maybe sooner. We shall see. Labels: Pike and Shotte, The Baroque Age - Wars of Louis XIV, The War against the Turk, Turkenkreig! 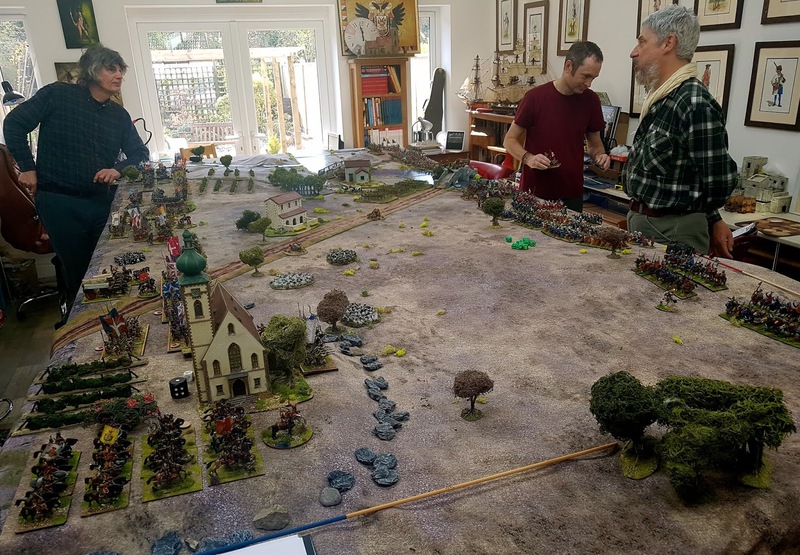 Another grand AAR from the Burrow. Always enjoy seeing your armies in action. Thanks David. Hope you can come and visit this year. Thanks Paul. Hope you can get up for a game again this year. Cheers Steve. It was a close run thing. I'm very lucky to have the set up I do. 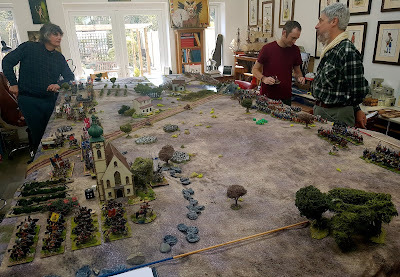 It was great fun and very pleasing the way it looked and played. Another titanic struggle and a great battle report! Looking forward to the next one. You make an excellent point about ‘playing the period’. Although rules cam help I agree that it’s down to the participants. Thanks. I almost felt like I'd been in a real battle. Yet to find a set that can't be spoilt by 'wargamey' rules slaves 😉 but some do come very close. Lovely looking game and a great report Colin. Thanks Damnitz. 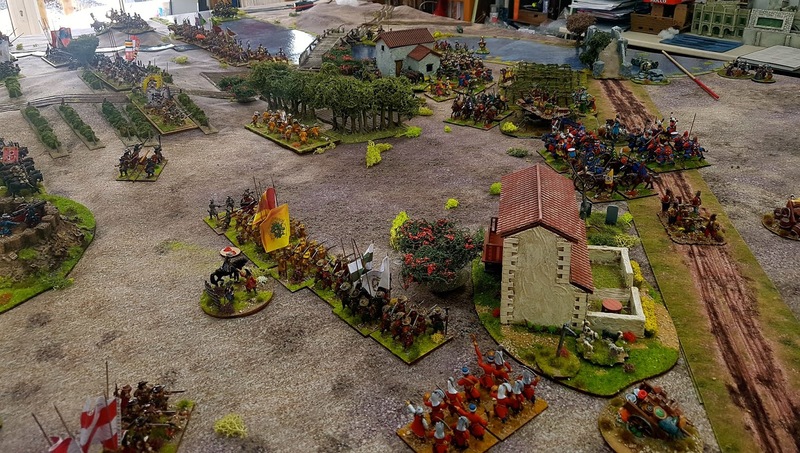 As it happens I have a game planned this Saturday when I will be pitting the Ottomans against my Poles.